Print media have been around a long time – since the invention of the printing press in the 1440s by Johannes Gutenberg – and are still a very important way of communicating ideas and information.The Romans were the first to realise the value of recording daily happenings – marriages, deaths, changes to whoever was in power etc – and would post important messages in public places. These had to be handwritten, however. Newspapers as we know them today really took off with the introduction of the printing press in the late 15th century. Early newspapers were often very political – and critical – in nature, and were often banned by governments. The longest-published newspaper in the world, The Times, was first printed in 1722 and has been published daily ever since. Once, newspapers were the main medium for communicating and receiving news. Despite challenges from radio, cinema newsreels and television during the course of the twentieth century, the newspaper industry remained robust and profitable. In the USA alone, more than 56 million newspapers were sold every weekday, and 60 million every Sunday. However, newspaper readership has been in steady decline throughout the 1990s and 2000s, and this trend looks set to continue, especially as younger readers (those in their twenties) are rejecting print-based news in favour of the online variety. Perhaps more significantly for the industry, advertising revenues fell by half between 2000 and 2011. However, it looks as though newspapers will survive. Most newspapers have embraced the Internet and now exist in both online and printed form – some have given up the printed form altogether. Many publications have found ways of replacing that lost advertising revenue by raising cover prices, increasing subscriptions, or keeping content behind a paywall. Newspapers are therefore still an important and powerful media form. While people look to the internet and TV for immediacy in news, they use newspapers to glean in-depth information about stories, and to get that information in their own time, at their own pace, which might mean reading it on a tablet or smartphone, rather than on sheets of paper. Newspaper owners have traditionally been very powerful political figures. In the UK, in the early part of the 20th century, newspapers were largely owned by rich, influential men, known as the press barons. Ownership of a newspaper was inherited with a title by the likes of Lord Northcliffe & Lord Rothermere, and they used their newspaper as a political vehicle, supporting politicians and policies as it suited their own beliefs. Nowadays the term "press baron" is still used to describe a newspaper owner, but they are more likely to the CEO of a multimedia corporation than a peer of the realm. Newspapers are now usually owned by big media corporations who also own TV & radio stations, other newspapers and magazines, internet service providers, publishing companies and a variety of other interests. NewsCorp, headed by Rupert Murdoch, is a good example of this. Have a look at their homepage to see the range of media assets owned by the company. Where Do Newspapers Come From? Printing thousands of copies of a daily newspaper is a hi-tech operation, and most newspapers have invested in state-of-the-art printing presses. What Restrictions Are There On Newspapers? 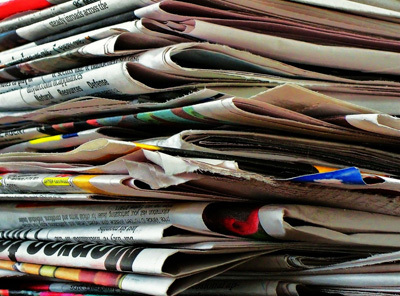 Newspapers often cause great controversy over their decisions to print certain material - whether it is a revealing photograph of a celebrity or a critique of government policy. Newspapers sometime publish material which is extremely embarrassing to individuals or companies, and print stories which cause great distress. Some lawmakers argue that newspapers should be bound by a strict code, and that they should not be able to make public details which may be considered private. However, most newspaper editors will argue that they should be able to publish whatever they want, as long as it is in the public interest. It is the perpetual battle between Free Speech and Right to Privacy. Newspapers risk falling foul of libel laws. Libel is the act of printing or repeating something about a person or a business that is both untrue AND damages their reputation. If a newspaper is sued for libel in court, and the plaintiff wins, the judge may award large amounts of money in damages. Therefore newspapers train journalists to be extremely careful about checking facts and gathering proof for stories, and may even employ a special team of editors (or fact-checkers) to prevent factual errors making it into print. Newspapers are complicated businesses requiring the skills and input of a range different people. On the front line are the news gatherers, the beat reporters and photographers who get out into the world and track down stories. However, they rely on editorial (copy editors and heads of department such as Sport or Business), sales (advertising, subscription and circulation), designers, IT, human resources, printers, distributors and an overall management team to keep the publication running. Despite shrinkage of the industry over the past couple of decades, newspapers continue to be exciting and fulfilling places to work, whether they reach their readers via the internet or in print form – but there are far fewer jobs available than there once were. Read more about analyzing newspapers here.